As we awaken to a dreary Friday morning in March, Doug Larson puts a spring in our step with his sensible wisdom. “Spring is when you feel like whistling even with a shoe full of slush.” Though it may be mud season and the winds can turn our weather cold at a moment’s notice, it is worthy mentioning a plant genus soon to be blooming. Azaleas and Rhododendrons, another one of the first flowering shrubs of spring clearly make the cut as the plant enthusiast’s specialty. This subject is vast and some spend their lives collecting and breeding the various species and varieties. Although plants within the genus can bloom from March until mid-summer in the Northeast, there are a number of early-bloomers that give the garden its first splash of color. Two plants to add to your collection: Azalea (Rhododendron) mucronulatum ‘Cornell Pink’ or an offshoot, Weston’s ‘Pink Diamond’. If you go with the ‘Pink Diamond’, an improvement on the mucronulatum, which blooms a bit later, you’ll see extra garden impact with its amazing pink flowers and its dramatic fall foliage. 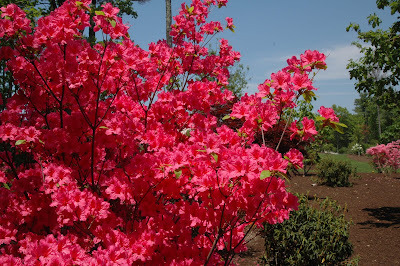 One of our local growers, Weston Nurseries in Hopkinton, MA introduced Weston’s ‘Pink Diamond’ as well as many other exceptional Azaleas and Rhododendrons, putting Massachusetts on the international botanical map. These acid-loving woody plants are both deciduous and semi-evergreen, depending on variety and make striking additions to your woodland garden. Plan now for a visit to Weston Nurseries http://www.westonnurseries.com/ or find one of the many area parks, arboretums or forests that have extensive collections. 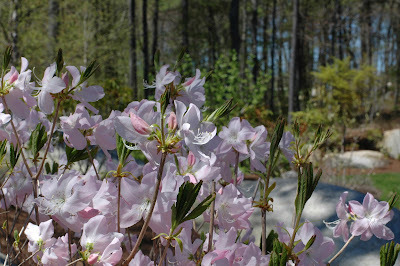 A spring walk at Wachusett Mountain in Princeton, MA (follow Administration Road) has wild azaleas growing along the trail’s edge. To end with our inspirational thought for the day by Geoffrey B. Charlesworth, think about the many ways you can immerse yourself in the season. “Spring makes its own statement, so loud and clear that the gardener seems to be only one of the instruments, not the composer.” Take a road trip or a walk in nature. Experience this delightful season soon to be upon us even if there is a bit of slush beneath your feet.